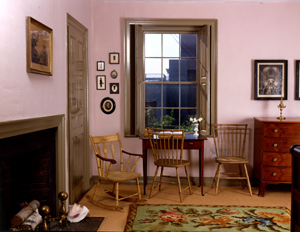 The bedroom of Anne Longfellow Pierce, 2002. Anne Longfellow Pierce lived many of her ninety years in a small chamber overlooking the garden. In this room, removed from Congress Street, Anne was handy to the parlor chamber where she helped care for her mother. After the death of her beloved George Washington Pierce in 1835, Anne returned to her childhood home and the company of her family. Her "mahogany chamber set" was distributed to family members in 1901, but many other family furnishings are exhibited here. Notable are the silhouette of George Washington Pierce and his plaster bust of Lord Byron, the Romantic English writer who was admired by Henry Longfellow and who was known for his infamous and daring life. Paint analysis revealed that the walls were painted only twice between 1785 and 1901. The pink replicates the mid nineteenth-century calcimine paint. The arrangement of the rear hall with its 1785 stairway to the kitchen and 1815 stair to the third floor allowed children and household help to access rooms without disturbing activities in the front of the house. Glass panes set into the stair-landing doors provided necessary light to navigate the steep passage. The wall bears a small handprint and the inscription "Eliza Wads-worth," [sic] who took advantage of the wet plaster while the interior was being completed in 1786.